Tired of sharing walls and pools at condo's? Kick back and relax at this 2 bedroom 2 full bathroom home with your own private Heated Salt Water Pool, private screened in patio, private propane grill, and private back yard. Pets welcome! Central Location positions you perfectly to take advantage of Sarasota's attractions. Located 9 minutes from Downtown Sarasota, 14 Minutes from Siesta Key public beach, and 7 minutes from the heart of Gulf Gate. Living room features 55" Smart TV, a sectional couch, two additional pub chairs, and a leather ottoman to put your feet up and take a load off. The master suite features a king size medium firm bed, 46" inch TV and updated bathroom with tiled shower. Large Dresser and large closet ensure there is plenty of storage for longer stays. Second bedroom has a Full size Bed and a Twin over Twin Bunk Bed. A large closet and dresser provide ample space to store clothes for all lengths of stays. Updated Kitchen includes stainless steel appliances, with all necessary kitchen needs including Standard Coffee Maker, Keurig, Crock Pot and all necessary items to cook large feasts. Indoor Dining nestled between kitchen and living room has seating for 4. Additional dining for 2 at bistro table just adjacent to main dining. Screened patio includes seating for 6+ at a Crate & Barrel dining set. Twin Chair and Ottomans add an additional space to put your feet up. 40" TV ensures you won't miss out on your favorite sporting event or program while taking advantage of Florida's weather. Weber Propane Grill provided, propane included. Pool area includes 2 loungers and 4 polywood Adirondack chairs. Beach Supplies: 4 beach chairs, kids toys, towels, and carrying bag provided. Tana is Realtor in Lakewood Ranch, FL for Premier Sotheby's International Realty and Drew is an Information Analyst at Wooster Community Hospital. We have two daughters. Love at first sight. Perfect location. Private outdoor space and a beautiful pool. We bought this house the first day it was on the market and will own it forever. 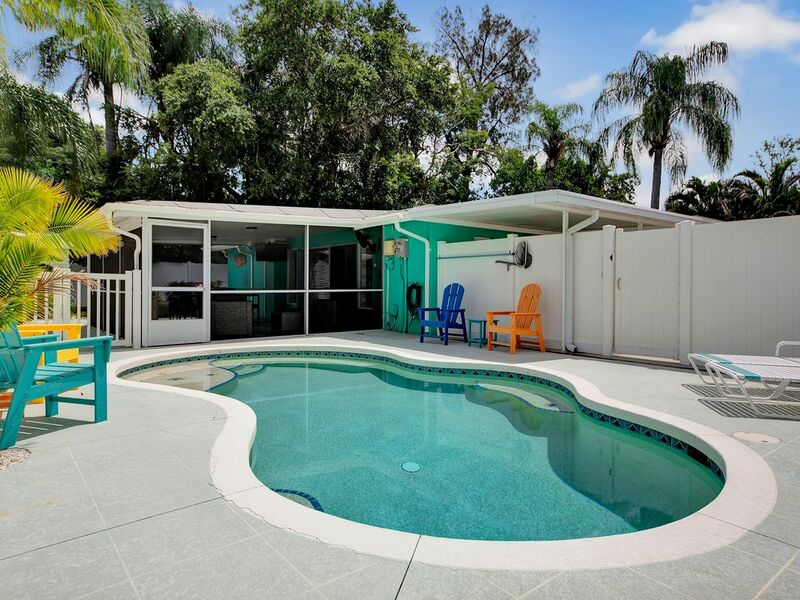 On a quiet street it offers a quiet spot to relax indoors or outdoors, but is within minutes to all of Sarasota's attractions including Siesta Key beach and all that downtown Sarasota has to offer.